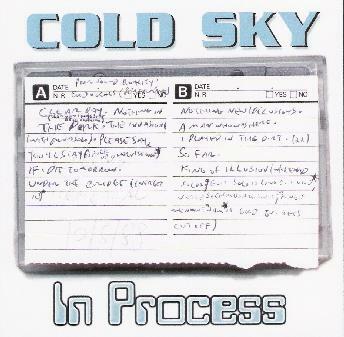 Cold Sky - "In Process" / Cold Sky - "The King Of Illusion Variations"
The newest editions in Greg Segal's Pale series of budget CDRs are two archival releases from Cold Sky, the late 1980s band Greg formed in the waning years of the improvisational quartet, Paper Bag. 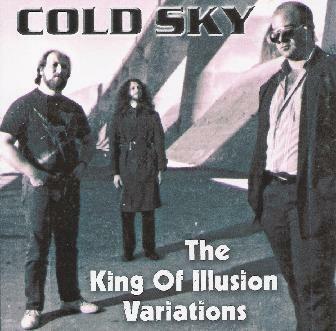 Cold Sky never had any official releases in its time, though Greg has been actively digging into the archives and making an assortment of music available in recent years. Like the previous Cold Sky release, "Live at Be Bop Records" (see AI #24), these two include the trio of Greg on guitar, George Radai on bass (also from Paper Bag), and Hyam Sosnow on drums (currently with Greg in Jugalbandi). In Process consists of recordings and rehearsals from 10/88-2/89 and live bits from a performance on KXLU radio on 11/20/88. One of the reasons Greg formed Cold Sky was to have a band that could play his songs, something that wouldn't work within the framework of the strictly improvisational Paper Bag. Greg had also released numerous solo cassette albums, so it's no surprise to see songs in this set from those. Like "Clear Day", originally on Greg's Water From The Moon album. It's hot 'n heavy power trio hard rock with a prog-psych edge. Hyam is unrelenting on the drums and we're treated to lots of mind blowing guitar gymnastics from Greg, as well as a tasty bass solo from George. The more than appropriately titled "Energetic" is a 13 minute freeform hard rock jam that showcases the skills of all three musicians. And there's lots of room here to stretch out, which the band surely does. They rock out, I hear jazzy bits, and they even get a little playful at times. Free-wheeling but controlled, and definitely on the more progressive side of the guitar/bass/drums hard rock spectrum. "The Invasion" is another song originally on Water From The Moon. We're really in heavy prog rock territory on this one, with intense vocals and lyrics, searing acidic guitar and varied percussion, both tribal and rocking. Lots of interesting thematic shifts and a theatrical feel. Ditto for "Nights Without Time", the other lengthy track of the set. It starts off with several minutes of atmospherics and playful interplay between the guitar and bass. But around the 5 minute mark the music gets very dark and moody, tension starts to build and there's a King Crimson-ish feel in the air, and even a bit of doom (as in "doom metal", but without the metal). Another great one for guitar fans, less for the pyrotechnics than for Greg's use of effects and varied ways of expressing himself. "Under the Bridge" is an instrumental that rocks hard but also includes some of the most melodic music on the album, as well as being a stunning showcase for Greg's guitar. "Nothing New", a song from Greg's 1985 A Man Who Was Here album, is given fast and furious punky Cold Sky treatment. And we've got three versions of the song "Please Say You'll Stay" (also from A Man Who Was Here), one of which is a good fun 'variations' track that includes discussion among the band about different ways to play the song. And finally, the epic "King Of Illusion" opens with ambient waves and rumbling space efx á la Hawkwind. After about 4 minutes of this trippy intro the band launches into heavy driving prog/space mode. Multiple elements of 70's rock come together to produce a ripping song that is fresher and more exciting than most music that was being produced in the late 80's. Space rock, psychedelia, prog, and just plain mind blowing ROCK music. This was one of my favorite songs of all Greg's solo releases. But backed by Radai and Sosnow, and Segal full of passion, fire and fury, the song commands a cosmic spot in Rock heaven. It's THAT good. Greg has written extensive explanatory notes but I'll be concise. The version of King of Illusion that bowled me over on the Live at Be Bop set was the only complete version of the song by Cold Sky that Greg has on tape. It's a lengthy track and always appeared at the end of their set and they typically ran out of tape. So Greg did some mix and match studio editing of the various versions, even throwing in some non-"King of Illusion" bits to produce the single 53+ minute track we have here. The end result is exactly what I described in the Live at Be Bop review and lots more. There's some distinct King Crimson influenced bits, Black Sabbath styled stoner rock, monstrous progressive psychedelic rock, plenty of soloing, and guitar work that will bring tears to your eyes. I am NOT exaggerating when I say there are few of your favorite pioneering 70s hard rock bands that these guys don't hold up to or even blow away. A few times throughout the album the music will be interrupted by somebody saying, "you think we've got enough tape? ", before launching back into yet another variation. And of course that's the point. I just checked Greg's web site and he's selling these for a measly $6 so you can get both on the cheap. HIGHEST recommendation… as the old Ralph catalogs used to say: Buy or Die! And spend time on the web site because it's a model for what an information driven web site should be about, being jam packed with detailed information about all of Greg's bands, projects and solo works.